During the first two years of Cason’s life, his parents had an instinct that something was wrong with their son’s hearing, yet every time they went to the doctor they were told he was fine. Believing differently, his parents took him to Arkansas Children’s Hospital’s audiology clinic when he was 2 years old. After only two appointments, the audiology clinic diagnosed him, fitted him and ordered his first hearing aids. “When we came to Arkansas Children’s Hospital, I felt like we had been rescued,” said Cason’s mom. Cason has bilateral sensorineural hearing loss, and there is no surgical or medical fix. However, his hearing loss has been treated with his hearing aid and auditory verbal therapy. 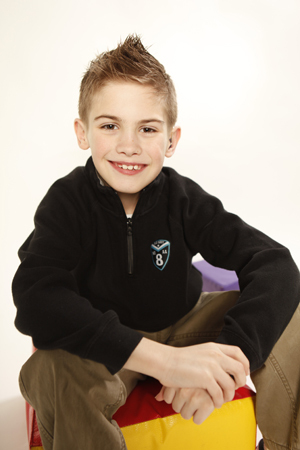 Cason, 8, accepts his diagnosis, but does not accept that it is a disability. He is a great soccer player, an avid reader, is well on his way to becoming a black belt in taekwondo and is extremely sweet and compassionate—that is, when he’s not pretending to be a WWE wrestler.